I know I haven’t posted in a long time, but something kind of funny happened recently and I couldn’t resist. Well, it turns out our neighbors have bought chickens and have not had their wings clipped yet. I snapped a photo of one of the chickens hanging out at my favorite morning spot. 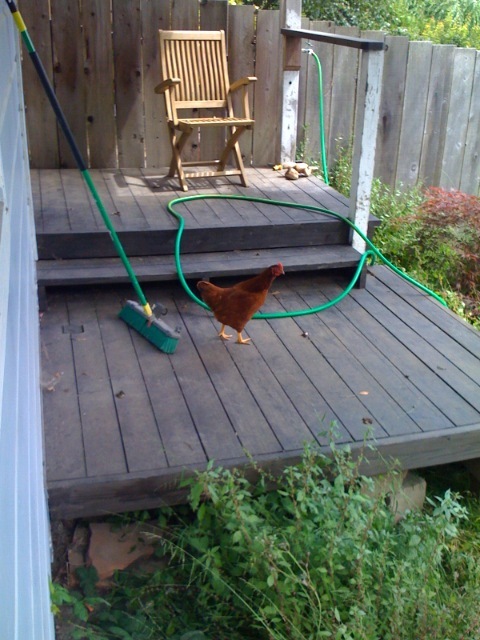 (The broom and hose are for cleaning up the chicken poop). I kind of like the thought of having chickens in our neighborhood, but I was worried our neighbor was going to get in some kind of trouble. After doing a bit of research, it turns out that it is legal to own chickens in San Francisco as long as you have fewer than four. Good to see you back online. Our neighbors have chickens as well and offer us eggs as “hush” payment ;) There is nothing like some home grown eggs. Anyway good to see you online and we ( at wheeler street ) would love to hear what you are up to when you have the chance. Until then happy sweeping! I have intentions of getting chickens my self. I live in Portland and you are legally allowed to have 3 without a permit. Right now I’m growing an organic vegetable garden and the chics would make a nice addition.